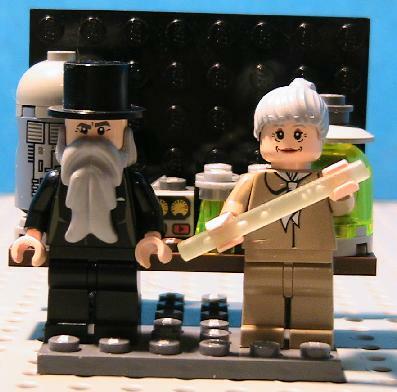 As a life-long fan of both Lego bricks and science, I was thrilled when the announcement for the “Brick Science” contest was posted on one of my favorite Lego fan-sites, Reasonably Clever, this August. The contest had four categories: “Good Scientist”, “Evil Scientist”, “Laboratory Diorama”, and “Real Scientist”. The last category had the most interest for me, and I set about creating a list of the scientists I would like to render in Lego bricks. Just for fun, I put a few figures together to get started; Thomas Edison, Leonardo da Vinci, the mad scientist Rotwang from the film Metropolis (for the Mad Scientist category). 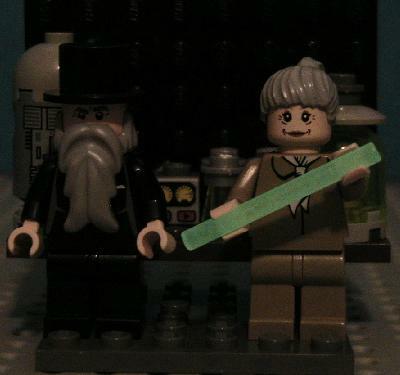 A glow-in-the-dark piece I had recently acquired inspired me to make a Lego Madame Curie, which led to the addition of her husband Pierre and a radioactive research lab. As I photographed them in normal light, it occurred to me that some “lights out” photos would also be needed to demonstrate the glow effect. While taking photos in the dark, I remembered that I had a black light and wondered how the parts would look under that. The photo turned out rather fuzzy, but looked keen. While helping Dr. Bakker with some IT issues at work the next day, I decided it would be extra cool to make a Lego version of him for the contest and maybe get him to endorse it by getting photographed with it. 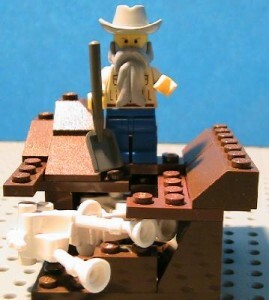 That evening, I put together a Lego vignette of Dr. Bakker using a tiny shovel to dig up some animal bones. I was a bit concerned that the only Lego animal skeleton in my collection is that of a horse, but Dr. Bakker assured me that he has actually dug up horse bones before, and therefore the model was accurate. 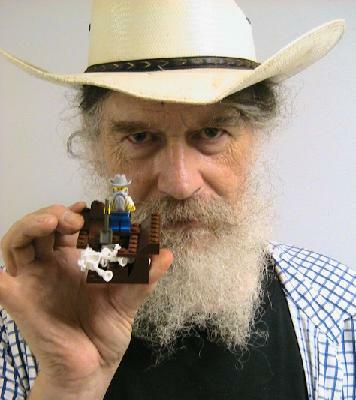 After selecting the cowboy hat for his figure to wear (there was a fedora available as well), I got a very nice photo of Dr. Bakker holding up his Lego effigy for the contest. Because only one entry was allowed per category, I had to submit Dr. Bakker under “Real Scientists”, and the Curies as “Good Scientists.” After that, I had to wait until the end of September to find out the contest results. Finally, the contest winners were announced last Tuesday. I was a bit disappointed that my Dr. Bakker vignette did not win, until I saw the very amusing depiction of “Theoretical Physicist Moog creating fire in the laboratory.” (To see it, click here and scroll down to “Class Four.”) It’s a good thing I took the black light photos of the Curies, as they seemed to appeal to the judges- “Curies in the Lab” won first place for “Good Scientists,” garnering me a Lego kit featuring Lego Alligators! All in all, it was a very fun contest. I would have been happy not winning a thing; it’s fun to build Lego scientists, especially when I can get the real scientist in on the game! Special thanks to Dr. Bakker for being a good sport and participating in the contest with me! What fun Ian!! We needed another Bakker around. I like your lego models. By the way have you heard of ROBLOX. Its a free online building game. Its like lego but your building is unlimited. you can desighn other ppl hats clothes etc. Also you can make commands. This game is very nice, i think you will really like it. Go to http://www.ROBLOX.com. My username is Whyatt. Posted by a really cool person. Yes, I have seen Roblox and it looks like a great time. From what I can see, Roblox can be a valuable tool for school assignments as well as for those who do not have a huge collection of bricks. As for myself, however, I have spent so many years acquiring ‘real-world’ bricks, that I feel compelled to use them for my models. I also enjoy the tacile sensation of sifting through the bricks to find the right part, and then clicking it into place. I most likely will not spend a lot of time with Roblox, as I only get an hour or so each day to build and simply prefer the real bricks. Thanks for the tip, and happy building! Thnx i understand that you like the lego bricks. Blocks are really there and not just a bunch of scripting like roblox. But with roblox you can litterally build to the unlimited and also when you build buildings you can get a viev from the inside. Also you can add special effects to bricks like glowing sparkling walkthrougable and accelerating etc. You can also add any image on a brick. but i understand that you like LEGO. Btw if u did make an account can you tell me your username even though you wont use it very often. Previous Post Blog Contest: Draw a Dinosaur!